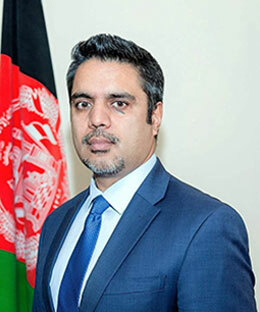 M. Ashraf Haidari is the Ambassador of Afghanistan to Sri Lanka. 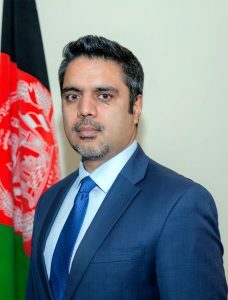 Mr. Haidari was the Director-General of Policy and Strategy of the Ministry of Foreign Affairs of Afghanistan from 2015-2018, during which he closely worked with the Ministry’s policy and administrative Directorates-General to plan for execution the annual and longer-term foreign policy objectives of Afghanistan set by the leadership of the Government of Afghanistan. In this cross-cutting role, he directly reported to the Minister of Foreign Affairs, while frequently collaborating with the Offices of the President, the Chief Executive, and the National Security Council of Afghanistan. From 2012-2015, Mr. Haidari served as the Deputy Chief of Mission (Minister Counselor) of Afghanistan to India where he was frequently Chargé d’Affaires A.I. His responsibilities also included non-resident representation of Afghanistan to Nepal, Bhutan, Maldives, as well as Sri Lanka, before Afghanistan elevated its relations with the country and opened an Embassy in Colombo in late 2013. From June 2011 to July 2012, he served as the Deputy Assistant National Security Advisor of Afghanistan, providing the Office of the National Security Council with policy and oversight advice on a range of domestic and foreign policy issues relating to national security. From 2004 to 2011, Mr. Haidari served the Embassy of Afghanistan in the United States in various capacities including: Chargé d’Affaires A.I. ; Deputy Chief of Mission and Political Counselor; Acting Defense Attaché; First Secretary for Political, Security & Development Affairs; and Director of Government and Media Relations. From 2001 to 2004, he worked as Assistant to the Vice President for Federal Relations and Assistant Director of Development at Georgetown University in Washington-DC. In 2000, Mr. Haidari was a research analyst at the Center for Documentation & Research of the United Nations High Commissioner for Refugees (UNHCR) and consulted with the UNHCR Department of International Protection on the Afghan refugee caseload in Geneva, Switzerland. From 1992 to 1997, Mr. Haidari held various field positions with UNHCR and the World Food Program (WFP) in Afghanistan, serving the Afghan internally displaced persons (IDPs) and refugees from Tajikistan. Mr. Haidari has represented Afghanistan in numerous bilateral and multilateral meetings, as well as international summits, conferences, forums, and seminars to discuss the country’s stabilization, reconstruction, peace and development processes, in partnership with the international community. He is a Senior International Security Fellow at the New America in Washington-DC; a Research Fellow at the Afghan Institute for Strategic Stutides (AISS) in Kabul; a Visiting Fellow at the Observer Research Foundation (ORF) in New Delhi where he was also a member of the editorial board of the Diplomatist Magazine and a Senior Research Fellow at the Delhi Policy Group (DPG) during 2015-2016. In addition, he is a blog-contributor at the Center for Public Diplomacy, University of Southern California. Mr. Haidari has consistently engaged in traditional and public diplomacy in order to maintain international focus on and support for the stabilization and sustainable development of Afghanistan. He has lectured on Afghanistan, regional and global security issues at many public and academic forums. Mr. Haidari is also a writer, whose writings have appeared in The Hindu, The Diplomat, The Diplomatist, The Foreign Policy, The Washington Post, The National, Eurasia Review, The Pioneer, The New York Times, The Washington Times, The Outlook Magazine, San Francisco Chronicle, The Boston Globe, The Baltimore Sun, Asia Times, Korea Times, The National, Diplomatic Courier, Diplomatic Traffic, The Washington Diplomat, EurasiaNet, Central Asia Newswire, and others. In addition, Mr. Haidari has discussed Afghanistan and regional affairs on international TV and radio shows, including CNN, CNN-IBN, Doordarshan News, Al Jazeera, BBC, VOA, CSPAN, NPR, Alhurra, TOLONews, and others. Mr. Haidari is internationally educated in the United States, Switzerland, and Afghanistan. He holds a Master of Arts in Security Studies (Concentration: International Security & Development) from the Georgetown University Edmund A. Walsh School of Foreign Service in Washington DC; and a Bachelor of Arts in Political Science and International Relations from Wabash College in Indiana. During 2002-2003, Mr. Haidari was a Fellow in Foreign Service at Georgetown University, and holds advanced certificates in International Affairs and Refugee & Humanitarian Emergencies from the University. Mr. Haidari is the recipient of many public and academic awards, including: The Fredrick J. Urbaska Civic Service Award, National Association of Wabash Men (NAWM), Indiana, 2011; The Pedro Arrupe, S.J., Award, Georgetown University, Washington, D.C., 2003; The Fellowship in Foreign Service Award; Georgetown University, Washington DC, 2002; The International Merit Award, Wabash College, Indiana, 1997; and The F. Michael Cassel Award; Wabash College Political Science Department, Indiana, 1999. The life and achievements of Mr. Haidari have been publicly recognized and featured in the following publications: The Hindu (December 2013), The Journal Review (December 2008), Indiana Daily Student (August 2007), The Washington Diplomat (January 2007), The Wabash Magazine (Fall 2005), The Georgetown University Office of Alumni & University Relations Newsletter (August 2002), The Wabash Magazine (Summer 2001), and The Bachelor (October 1998). Alongside the President of Afghanistan Mohammad Ashraf Ghani, Mr. Haidari serves on the board of the Louis and Nancy Hatch Dupree Foundation in Washington DC, which supports the Afghanistan Center at Kabul University. He also served on the board of the Roots of Peace in San Francisco, which works to restore economic vitality by creating livelihood opportunities in post-conflict regions, including Afghanistan. Moreover, Mr. Haidari formerly served as a trustee of the Afghan Education Peace Foundation in New York. Mr. Haidari was born and grew up in Afghanistan, and shares a personal story that resonates with millions of other ordinary Afghans touched by decades of conflict. He experienced these hardships firsthand both under the Soviet occupation in 1980s and the Taliban rule in 1990s. Mr. Haidari is married and has one son.